History: 50 year old male with severe chest pain has incidental finding on a CT of the thorax ordered for thoracic aortic dissection. 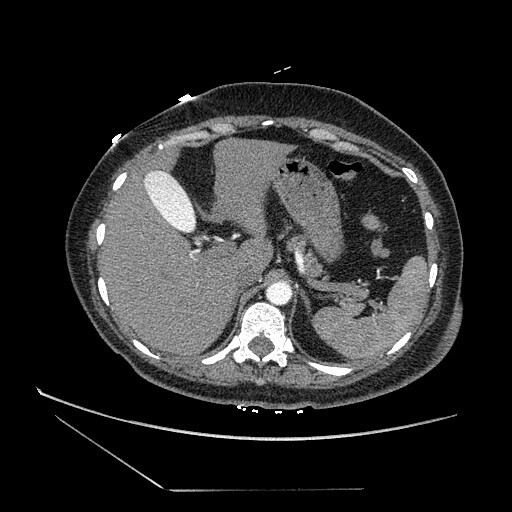 Vicarious contrast material excretion: Single axial CT scan through the abdomen (the last image from the CT of the thorax) in arterial phase shows contrast material within gallbladder. Contrast material excretion by the gallbladder is called vicarious contrast material excretion (VCME). Vicarous contrast material excretion is technically defined as any excretion of contrast material in a way other than the normal renal excretion. Classically it is associated with unilateral kidney pathology; however, it can be a normal variant. « Lung Bullae – Bullous emphysema.